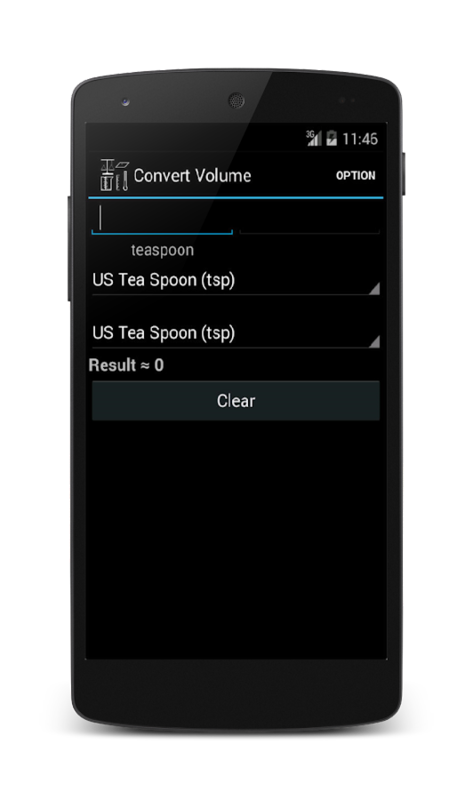 IMPORTANT: THE RESULTS ARE APPROXIMATIVEDescription: This App canmake conversion between UK imperial/US customary measure units andmetric units. It can convert Length, Weight, Area, and Volume.Itcan also - make conversion between Carat, Nautical Mile and Knot toMetric and the US/UK weight units. - make conversion between °C and°F - make conversion between Calories and kilojoule for FoodEnergy. Finally, you can change the result format for the US/UKmeasure. For example you can set the result to 1ft 2in or 1.2ft. ATTENTION: LES RÉSULTATS SONT APPROXIMATIFSDescription :Cetteapplication fait la conversion entre les Unité de MesureUS/Britanique (Impérial) et Métrique. Elle peut convertir lesUnités de Longueurs, de Poids, De Superficies et de Volumes.Ellepeut également faire la convertion de: - Carats et lesUnités de Poids. - Milles Nautiques etNœuds - °C et°F - Calories etKilojoulesLes Unités Disponiblent sont les suivants: LongueursUS/Impérial: Pouce (in), Pied (ft), Verge/Yard (yd), Chaîne (ch),Mile (mil), Mile Marin (NM). Longueur Métrique: Millimètre (mm),Centimètre (cm), Decimètre (dm), Mètre (m), Decamètre (dam),Hectomètre (hm), Kilomètre (km). Poids US/Impérial: Grain (gr),Once (oz), Livre (lb), Quintal US/Impérial (sh/long cwt), TonneUS/Impérial (sh/long tn). Poids Métrique: Milligramme (mg),Centigramme (cg), Decigramme (dg), Gramme (g), Decagramme (dag),Hectogramme (hg), Kilogramme (kg), Tonne (t). Poid de Diamond:Carat (ct) Volume US/Impérial: Once Liquide US/Impérial (fl oz),Roquille Liquide US/Impérial (fl gi), Pinte Liquide US/Impérial (flpt), Quart Liquide US/Impérial (fl qt), Gallon Liquide US/Impérial(fl gal). Volume Métrique: Millilitre (ml), Centilitre (cl),Decilitre (dl), Litre (l), Decalitre (dal), Hectolitre (hl).Superficies US/Impérial: Pouce Carré (sq in), Pied Carré (sq ft),Verge Carré (sq yd), Vergée Carré (rood), Acre (ac), Mile Carré (sqmil). Superficies Métrique: Millimètre Carré (mm²), CentimètreCarré (cm²), Décimètre Carré (dm²), Mètre Carré (m²), DécamètreCarré (dam²), Hectare (hm²), Kilomètre Carré (km²). Vitesses: Piedpar Seconde (ft/s), Mile par Heure (mph), Mètre par Seconde (m/s),Kilomètre par Heure (hm/h), Vitesse du Son (Mach), Noeud/Mile Marinpar Heure (knot). Le Format de Résultat pour les MesuresUS/Britanique peut être -Simple: example 1.2 ft pour 1,2 pieds-Détaillé: example 1 ft 2 in pour 1 pied et 2 pouces.Finalement,cette App ne collecte Aucune Donnée Personnel.CAUTION: THE RESULTSARE APPROXIMATEDescription:This application makes the conversionbetween the unit of measurement US / Columbia (Imperial) andMetric.It can convert Length Units, Weight, De Areas and Volumes.Itcan also do the convertion:- Carat Weight andUnits. - NauticalMiles and Knots- ° C and ° F- Calories and kilojoulesThedisponiblent Units are: Lengths US / Imperial: Inch(in), Feet (ft), Yard / Yard (yd), Chain (ch), Mile (mil), MarinMile (NM). Length Metric: Millimeter (mm), centimeter(cm), decimeter (dm), meter (m), decameter (dam), Hectometer (hm)Kilometre(km). WeightUS / Imperial: Grain (gr), Once (oz) Pound (lb), Quintal US /Imperial (sh / long cwt) Tonne US / Imperial (sh / longtn). Weight Metric: Milligram (mg) centigram (cg),decigram (dg), Gram (g) decagram (dag), Hg (hg), Kilogram (kg)Tonne (t). Weight of Diamond: Carat(ct) Volume US /Imperial: Once Liquide US / Imperial (fl oz) Roquille Liquide US /Imperial (fl gi), Pint Liquide US / Imperial (fl pt), QuarterLiquide US / Imperial (fl qt), Gallon Liquid US / Imperial (flgal). Volume Metric: milliliters (ml),Centilitre (cl), deciliter (dl) Litre (s), decaliters (dal),hectoliters (hl). Dimensions US / Imperial:Inch Square (sq in), Square Feet (sq ft) Verge Square (sq yd),virgate Square (rood), Acre (ac), Mile Square (sqmil). Metric area: Millimeter Square (mm²),Centimeter Square (cm²) Square decimeter (dm) Square Meters (m²),Measuring tape Square (dam²) Hectare (hm²) Square Kilometre(km). Speeds: Foot per Second (ft /s), Mile per Hour (mph) Meter per second (m / s) Kilometers perHour (hm / h) speed of sound (Mach), Node / Marin Mile per Hour (knot).The Result Format for US / Columbia Measurements canbe -Simple: Example 1.2 ft to 1.2ft -Détaillé: Example for 1 ft 2 in 1 foot and 2inches.Finally, this App does not collect Personal Data No. IMPORTANT: THE RESULTS ARE FOR REFERENCE ONLY.Description: This Appcan make conversion between UK imperial/US customary measure unitsand metric units. It can convert Length, Weight, Area, andVolume.It can also - make conversion between Carat, Nautical Mileand Knot to Metric and the US/UK weight units. - make conversionbetween °C and °F - make conversion between Calories and kilojoulefor Food Energy. Finally, you can change the result format for theUS/UK measure. For example you can set the result to 1ft 2in or1.2ft. Unit Converter is a simple, smart and elegant tool with more than44 categories of units that are used in daily life. This is theonly Unit Converter App in Google play store that has such a widerange of Unit conversion features with very simple and optimiseduser interface. BEST FEATURES OF UNIT CONVERTER APP ✓ Built-In realtime Currency Converter and their latest exchange rates. ✓ 44 unitcategories ✓ 12700+unit conversions ✓Smart Tools - Bubble Level,Compass, Protractor, Resistor codes, Stop Watch, Ruler, World Time,Date Converter and much more. ✓Currency Converter - now supports162 world currencies with latest exchange rates ✓New Tools -Battery Monitor, Notes, Expression Evaluation, Equation Solver,Induction Colour codes, Scientific Calculator ✓Offline CurrencyConverter feature lets you to convert all the world currencieswithout connecting to the internet. ✓ Has the highest number ofunit conversion categories among all other unit converters. ✓ Nowyou can add a Unit converter Widget to your home screen and convertall the units without opening the application ✓ Now added FinancialCalculators and Mathematical Calculators along with other unitconverters. ✓ Time Zone Calculator with day light savings andaccurate time differences calculations. ✓ Has most importantconversion tools that are used in daily life including FuelCalculations, Temperature, Volume, Speed, Weight, Computer Storage,Angle, Power, Viscosity, Force, Energy, Torque, Density and muchmore… ✓ Has Engineering conversion tools like radiation, electricresistance, electric capacitance, inductance, inertia, specificheat density, specific heat capacity, and illumination. ✓ Built-InCalculator to perform basic arithmetic operations on the fly whileusing the unit converter. ✓ Built-In Search functionality. ✓Supports both Metric and Imperial Units ✓ A Feature to add andcustomise Favourite Units. ✓ A Feature to add your own Custom UnitConversions. ✓ Financial calculators - Loan calculator, Compoundinterest calculator, Retirement calculator, Service tax calculator,Stock calculator ✓ Maths calculators -Roman numeral converter,Number base converter, Number series generator, Ratio, Fraction,Proportion, etc.. ✓ First ever Unit Conversion App to feature andsupport Latest Material design. ✓ All the cool features foravailable absolutely free of cost. Our Unit Converter is thehighest rated Unit Converter App in Google play store. Our app hasover a Million user base. Our unit converter app has the likes ofvarious users ranging from students to a high level Professionalwho use conversion tools for their daily activities which servestheir purpose. All this was possible because of the Simple andengaging user experience along with most number of important andhighly useful conversion tools. P.S. Unit converter was designedwith the goal of supporting wide range of devices from small screenphone devices to large screen tablets plus it features worldwidelanguages and their conversion system. We aim to add and supportmore range of units to the application in the near future. Thanksfor your continuous support. Unit converter is the 6th set of Smart Tools® collection. This appincludes Currency (money, bitcoin) exchange rates. There are a lotof unit conversion apps on the market. However, most areinconvenient and difficult to use because of poor and complicatedUI. This app has intuitive and simple UI, that is designed forcasual user like you. Trust me. :) I've sorted essential unit setsfor your daily life into 4 categories. - Basic : length (distance),area, weight (mass), volume (capacity) - Living : exchange rate,temperature, time, speed, shoes, clothing, hat, ring - Science :pressure, force, work (energy), power, torque, flow, current,voltage, density, viscosity, concentration, astronomy - Misc. :angle, data, fuel efficiency, cooking, illuminance, radiation,prefix, binary, time zone, blood sugar, hardness, AWG It showsdifferent unit sets depending on user's country. When you need moreunits, please send me an email. [email protected] * Do you wantad-free version? download [Unit Converter Pro]. For moreinformation, watch YouTube and visit the blog. Thank you. ★android.permission.INTERNET: for receiving the latest exchangerates. Best Unit and Currency Converter App converts Imperial, Metric,Weight, Length, Area, Fuel, Mileage, Power, Time, Pressure, Speed,Temperature, Volume, Data. Convert Units FREE app - Units Plus BestUnit & Currency Converter - Metric to Imperial Conversion***Now with LIVE Currency Updates for all major currencies in theworld*** Very simple and beautifully designed unit converter with12 different conversion categories and many different units:CONVERT UNITS: *Area *Currency (155 world currencies updated every15 min.) *Data-computer data (byte, kilobyte, megabyte, etc. )*Fuel-milage *Length *Power *Pressure *Speed *Temperature *Time(days, weeks, hours, etc.) *Volume (dry and wet) *Weight-massCurrency exchange rates are downloaded every 24 hours when app isopen. Every download uses very small amount of data. Around 1-2kb.Internet connection required. 155 currencies available - This isall world currencies with their respective country flags.